With their floppy ears and boundless enthusiasm, English Mastiffs are some of the cutest, burliest dogs you’ll ever own. They’re awesome lap dogs, and are well known for being some of the best friends you can have; however, you want to return that friendship with some good nutrition and a healthy diet. To that end, we’ve broken down some helpful information for feeding your English Mastiffs, and even some of the best dog food for that breed. **There's more info below, but you can also click the links above to see current prices or read customer reviews on Chewy. **Disclaimer: Our dog food reviews are based mostly on (1) our expertise and that of the experts with whom we consult and (2) the information provided by the manufacturers. We do test many dog foods (with our dog's help), but we can't test them all. As such, please remember the above recommendations are our opinions, and you should consult your vet before making changes to your dog's diet. **Please note: these estimates are based on an average weight for this breed. Every dog is different. Please talk to your vet before making changes to your dog's diet. English Mastiffs are some of the biggest dogs in the world, with many of the male varieties reaching up to 250 pounds! Even lady mastiffs will often reach up to 180 pounds, meaning that caring for these dogs is serious business, and leads to them downing a lot of food. If you have an average-sized 200 pound English Mastiff, for instance, you’ll want to get them around 3239 kcal/day, as long as they’re of typical adult age and engage in appropriate levels of physical activity. For those Mastiffs that are a little older and less active, you can reduce that level down to about 2650 kcal/day if you like. If your Mastiff is especially active, though, and likes to get in plenty of physical activity, be sure to get them about 3680 kcal/day. LEARN MORE ABOUT ENGLISH MASTIFFS ONLINE! This video is a solid summary of the English Mastiff’s personality, breeding, and heritage. It showcases the size of most adult English Mastiffs, the heavy musculature and dense bones, and some helpful tips for differentiating breeds, giving them a good environment and feeding them appropriately. English Mastiffs, because of their large size and smooth coat, require a specialized diet that might differ somewhat from many other dog breeds you may encounter. For instance, English mastiffs do not actually require a very high protein diet; this can present problems when trying to find the right kind of dog food, as a lot of them are extremely high in protein. While getting your mastiff some protein is always good, you don’t need to overload them – their own metabolism will take care of their protein intake for you. Now, what kinds of vitamins and nutrients should your Mastiff be getting? Well, you need to make sure your Mastiff gets food that has few grains and no corn, as those are simply empty carbs that have no place in your dog’s diet. While protein is still an important element of a Mastiff’s nutrition, you also want to make sure they get plenty of healthy fats. Fish oil and coconut oil, for instance, contain omega-3 and omega-6 fatty acids, which are healthy fats that help keep your dog’s heart healthy and their coat nice and shiny. Ideally, the best dog food for English Mastiffs can provide those for you; otherwise, you can consider giving your dog a supplement at you and your veterinarian’s discretion. Bloat. Mastiffs can suffer from gastrointestinal issues, which makes it doubly important that you give them proper, well-balanced nutrition with plenty of fiber. Heart disease. Be sure to get a feed that has plenty of omega-3 and omega-6 fatty acids to promote heart health. Orthopedic problems. 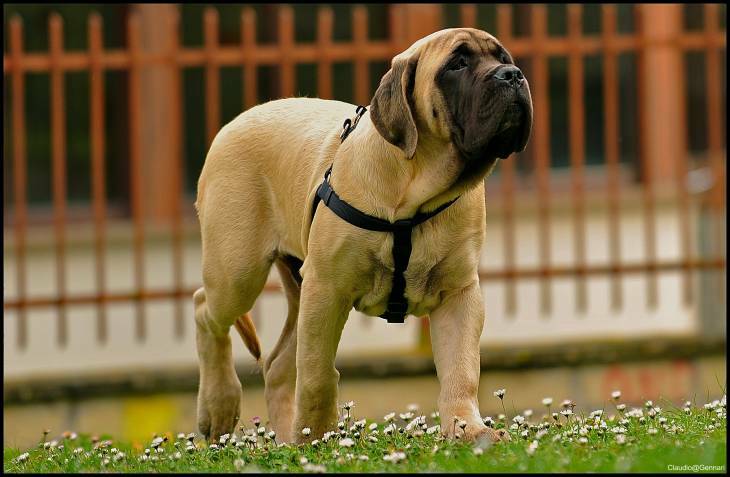 Hip dysplasia and the like are common among Mastiffs and other dogs; make sure to avoid overfeeding them in the puppy stage to prevent them from growing too much for their frame to handle. Also don’t overfeed them calcium; you may think you’re helping, but research shows that higher levels of calcium actually do lead to higher instances of hip dysplasia. Epilepsy. This can be difficult to treat in Mastiffs, so be sure to treat them with care when feeding. Urinary infections. Keep plenty of water close by and within easy access of your Mastiff. Eye diseases. Get a nutrient-rich feed that has beta carotene to promote proper eye health. Throughout your Mastiff’s lifespan, you’ll want to change up your habits depending on their age. With young Mastiff puppies, for instance, should be weaned off milk as soon as they can open their eyes; try to introduce them to high-calorie, high-protein foods as early as possible, maybe with some ground lamb or beef (about the size of a walnut), for a couple of days before moving them onto specially formulated foods. Here’s a good rule of thumb for feeding Mastiff puppies: feed 3-4 cups of food for day until they’re 8 weeks of age, 4-6 cups until 12 weeks, 6-8 cups until 16 weeks old, 8-10 cups from 4 to 6 months of age, and 8-12 cups per day from 6 to 18 months of age. This will get them the proper nutrition and protein/carbs they need to grow into the big, strong Mastiff dogs you’ll likely expect. That being said, take care not to overfeed your Mastiff puppy expecting them to grow even larger; their genetics will take care of that as well. However, overfeeding a Mastiff puppy can lead to orthopedic problems throughout their life as they have trouble with overgrowth. Be sure to measure out your feed carefully and time it out well for your Mastiff! English Mastiffs are a particularly large breed of dog, so you might want to spring for a large-breed feed, a category which Wellness Core Large Breed Formula can easily slot into. This particular feed is quite strong and high in protein content, without overloading the dog’s diet with protein (as Mastiffs don’t really need that much protein, at least as much as you might think). Wellness Core’s dry products are well above average, with a fat to protein ratio of approximately 44% - this allows for more protein than most dry dog foods, while also maintaining the same amount of fat and fewer carbs. 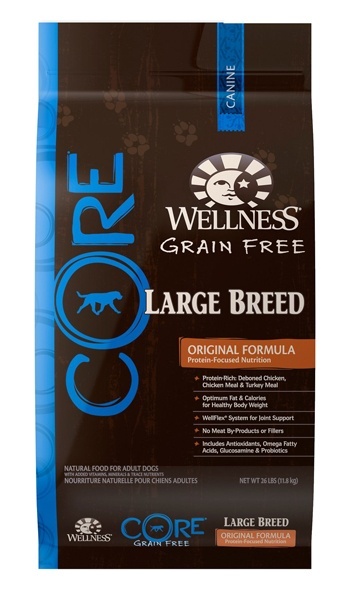 Wellness Core is one of the strongest dog food brands out there, so naturally their large-breed formula is fairly solid as well. The food itself settles on a nice ratio of 37% protein, 34% fat, and 29% carbs – which is even low-carb by most dog food standards. On the protein side of things, Wellness Core contains mostly chicken, and chicken and turkey meal, allowing for plenty of lean protein content to help your Mastiff grow up nice and strong. Additional protein and fiber are provided from legumes like peas and the basic carb content of potatoes. There are quite a few fantastic dog foods for English Mastiffs out there – this is just the one we thought would fit best for most dog owner’s specific needs. However, there’s always more research to be done, so make sure to talk to your veterinarian and do as much homework as you can before deciding on a diet plan for your English Mastiffs. Since English Mastiffs are huge, huge, huge dogs, you’ll want to be extra careful to give them the right food. We hope this comprehensive guide has given you some pointers; pretty soon, you’ll be sure that your big, fluffy and floppy Mastiff is in the best of health! What is the Best Dog Food For Irish Wolfhounds?